Winter is the worst time of the year. Bones creak; sniffles refuse to go away, viral and flu attack. And the most dangerous among these bugbears are, of course, heart niggles. "We're anyway sluggish in the winter months, and tend to eat more," explains Dr Anil Dhall, 48, Head Of Department, Cardiology, Max Hospital, New Delhi. As it would lead to unique winter ailments, it is better to take precautions, says Dhall. Jokes aside, when a person feels cold, the body's automatic response is to narrow the blood vessels. With the blood flow thinning down, the body doesn't lose as much heat. But for people who already have arteries filled with plaque, the narrowing of the blood vessels could lead to the vessels being blocked. It, in turn, could lead to a heart attack. The narrowing also increases blood pressure, which can strain a diseased heart. So bundle up this winter, and keep your blood flowing freely. 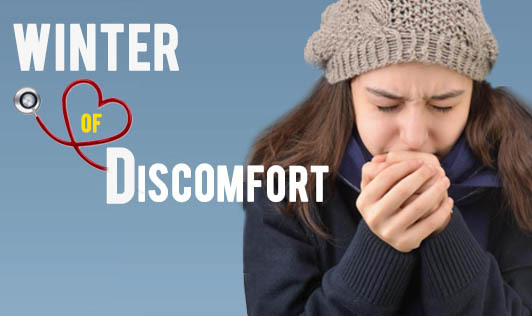 It is easy to keep the winter diseases at bay, if you are healthy. It also helps if your immune system is strong. There is, however, no guarantee that a fit of bronchitis could be kept away. Cases of bronchitis, warns Dhall, tend to go up rapidly. The message is clear: get the body's resistance power up and running and rest assured you can ward off indigestion, flu, bronchitis and common coughs and colds. A flu infection can increase blood pressure, stir up white blood cell activity, and change C-reactive protein (a protein in the blood that reflects the intensity of inflammation) and fibrinogen (a protein involved in the clotting of the blood) levels in the blood - all bad news for your heart. Hence, chances of the heart packing up with a compromised immune system are much higher. Do the following, to get higher immunity, and hence, a healthier heart. Healthy Stews and Soups. Winter vegetables are delicious and cheaper. It is easy to make a stew with capsicums (vitamin C), carrots (vitamin A), tomatoes (lycopene), spinach (folate) and cauliflower or broccoli (antioxidants). Mix it with a piece of chicken, if you're non-vegetarian. Add onions, garlic (natural antibiotics) and chilies (keep us warm) sautéed in olive oil (lowers bad cholesterol) to spice it up. Don't forget a dash of lemon for the tang of vitamin C. You can also make all these vegetables independently. However, overcooking will kill the benefits. Cover Up. Wear protective clothes. A cardigan on top of a shirt and a round-neck T-shirt close to your skin will be warmer than a T-shirt and a thick jacket. Older people - 45 years and above - find it hard to detect changes in temperature. They have to be more careful than the younger ones. There are immediate changes - within seconds - in your body on exposure to a drop in temperature. The colder the weather is the more profound are these changes. And remember, if the temperature falls well below zero, stay indoors. Only polar bears are made for this type of weather. Use Common Sense. If you are bald, wear a hat or cap. If you catch cold easily, wear thermal underwear. If you get blue knees, feet or hands easily, cover them up. If you are very thin, wear more clothes. Simple, really! Sip The Green. Green tea, three or four times a day (you can add honey and lemon), increases immunity. It also satisfies your heart's craving for something warm on a wintry day. Keep in mind that the Japanese get fewer heart attacks because they sip green tea through the day. Exercise Sensibly. At work, you could wait for an hour after lunch, and then step out for a short walk in the sun. The vitamin D in the rays will boost your immunity. Walking or exercising after a meal increases the risk of a heart problem. Party Wisely. Pubs are no place for non-smokers, cautions Dr Dhall. "My first rule is, if a heart patient is a smoker, I ask him to go somewhere else," says Dhall. Dancing after meals is risky. Don't Binge-Drink. While alcohol most certainly keeps us warm during winter, and moderate drinking is known to prevent the arteries from clotting, binge alcohol would be taking it too far. Consuming more than 5 pegs in an hour or 6 pegs (30 ml per peg, not 60!) in a day can precipitate a heart attack and sudden cardiac death. Go Slow On New Year's Resolutions. Every New Year's day, thousands of people join gyms or start exercise programs as part of a New Year's resolution to get in shape. And in the process, many may overexert themselves. Lose weight, not your life. Start slowly and build up. Take Supplements. It's a known fact that fewer hours of daylight in winter could lead to mood swings. It could result in higher levels of depression, and can also affect the heart. Studies have looked at heart attack patients and found they have lower levels of vitamin D (which comes from sunlight) than healthy people. So take 400 IU (international units) of vitamin D every day in winters. And take a B-complex and vitamin E to boost your immunity too. A Good Night's Sleep. Get some shut-eye for seven to eight hours. If you can nap in the afternoon, you cut your risk of heart problems drastically. In a Greek study in February 2007, systematic nappers - those who took a siesta for 30 minutes or more three times a week had a 37% lower risk of heart-related death. Among working men, those who took midday naps either occasionally or systematically had a 64% lower risk of death from heart disease.